Boston's huge St. Patrick's Day Parade, traditionally held each year on the Sunday closest to March 17, attracts up to a million spectators, depending on the weather. You can expect crowds dressed in plenty of green to line both sides of the South Boston parade route. Spectators stand 12-deep in some areas, especially around the Broadway T station - so arrive early and walk down Broadway to a less-crowded spot if possible. 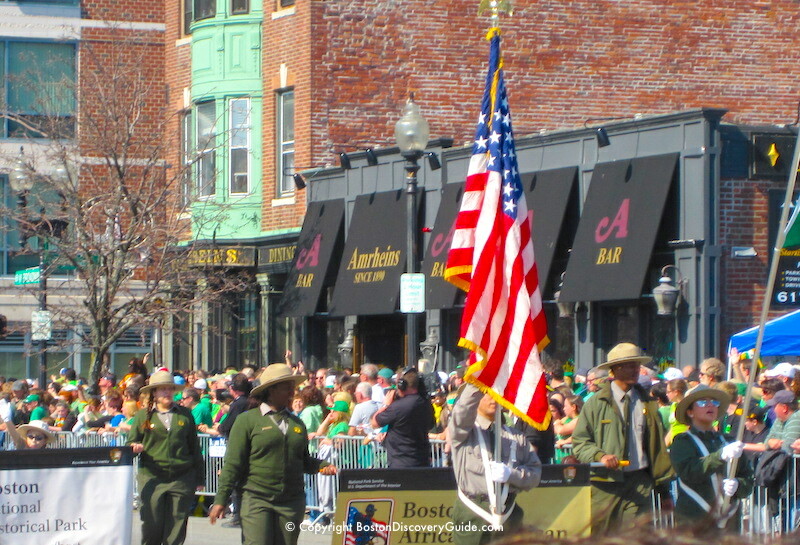 In addition to Saint Patrick's Day, the parade also celebrates Evacuation Day (an official Boston holiday) in honor of the ousting of British troops from the city on March 17, 1776. As a tribute this historic event, the parade also honors our military services and veterans. The parade features an interesting mix of bagpipes, brass marching bands, elaborate floats, military units, dancers, historic Minutemen companies, politicians, entertainers, individual marchers, societies, and other organizations. A Peace Parade sponsored by Veterans for Peace usually follows the Saint Patrick's Day Parade. 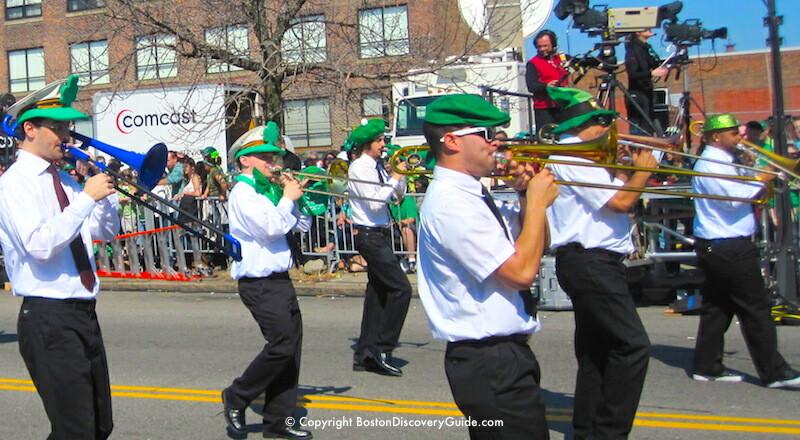 Check details about the date and time for the parade on the March Events Calendar for Boston. 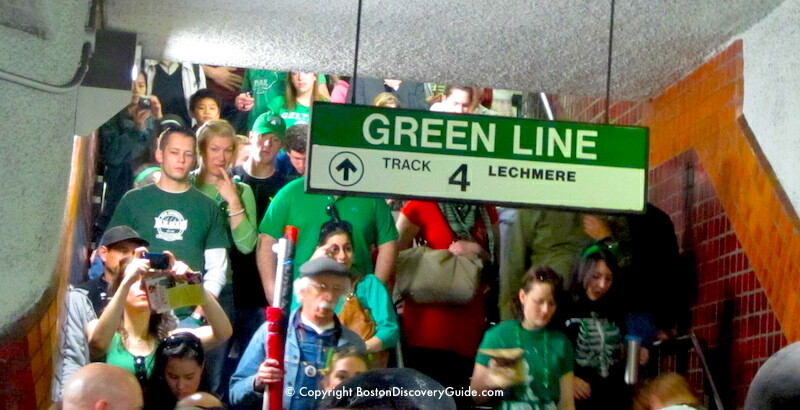 The 3.2 mile route for the St. Patrick's Day Parade begins at the Broadway T station (Red Line). It continues along W. Broadway to E. Broadway, and then turns near the water at Farragut Square. The parade turns at P Street and go back up E. 4th Street, turn left at G Street, and shift to E. 5th Street at K Street. It then circles back around historic Dorchester Heights on Telegraph Street to Dorchester Street and heads west to Andrew Square (Red Line/Andrew T stop), where it ends. Best Places to Watch the St Patrick's Day Parade - Plus Another 6 Important Survival Tips! Boston's St. Patrick's Day Parade is much more than just a commemoration of an occasion to toast the Emerald Isle with green beer. It recognizes the contributions of Irish Americans to past and present day Boston, and celebrates the city's Irish heritage. But most important, the parade is fun, and it draws enormous crowds - it's the 2nd largest parade in the U.S.
1) Pick your viewing location carefully. The parade route covers almost 4 miles, from the start point at the Broadway T (subway) station and the end at the Andrew T station. The biggest crowds gather around Broadway and Andrew Stations, so avoid these locations if you're at all claustraphobic or harbor secret fears about being crushed to death. 2) Stake out your viewing spot early. You're competing with up to one million other spectators curbside space. With a 4-mile route, that's still an average of a quarter million of people per mile. 3) Do not drive. 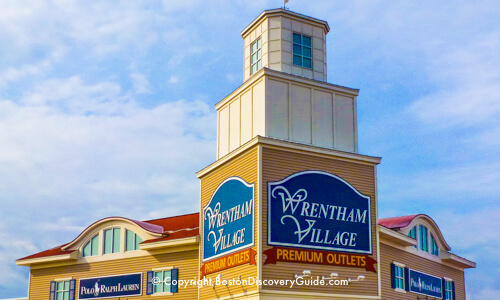 South Boston parking always is challenging because most available spaces are "Resident Only." Many streets will be closed to cars, while parking won't be allowed along others due to both the parade and the 5K road race earlier in the day. Even where cars are allow, the police give pedestrians the right of way - so you'll be unable to move most of the time. Plan to take public transportation or walk. 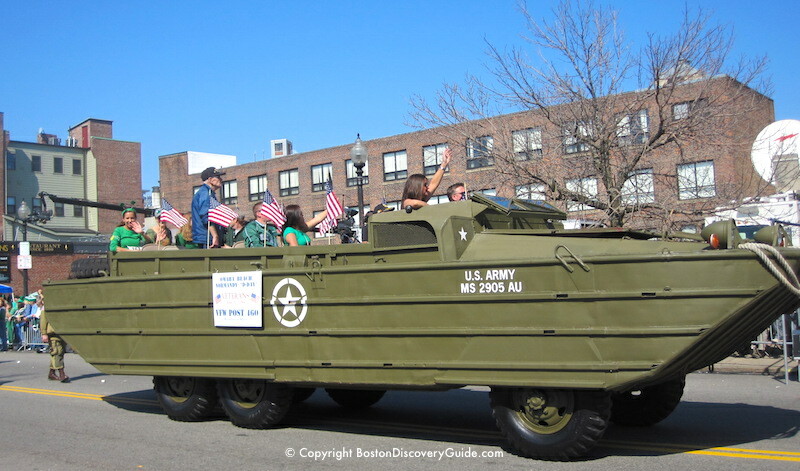 4) Expect huge crowds on the T, especially between about 12 noon and 1pm, when the parade starts. Actually, "huge crowds" is an understatement . . . I was running late...didn't board the T's Red Line at Park St to head to the St Patrick's Day Parade until 12:15pm - NOT a good idea! Thousands of people already packed the train, but more and more people continued to squeeze inside the doors. We joked about being unable to breathe - finally appointed a couple of big guys to block the doors...but still, at several moments I seriously worried about being crushed to death. Lesson Learned: Even when you're not much more than a mile away, plan to arrive early! 6) Don't plan to drink in public. In response to rowdy crowds, bar brawls, and street fights in past years, the Boston police keep a very close watch on the crowds, and in fact do an amazing job of keeping everything mellow and friendly. 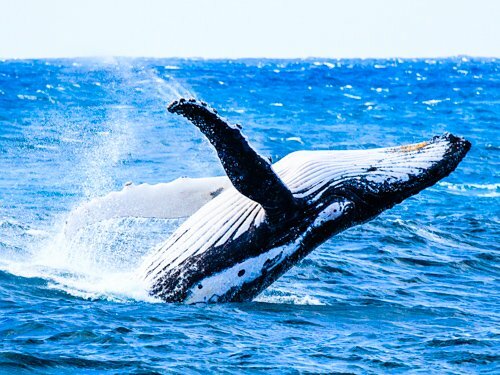 7) Wear sunscreen and bring plenty of drinking water, especially if the temperature ever soars near 80 degrees, as it did when the photos on this page were taken. Who knew you can sunburn in March in Boston? During more typical March weather, dress warmly and bring gloves and a hat as you'll be standing outside for long periods of time. The huge St Patrick's Day Parade is the Boston's biggest parade of the year. 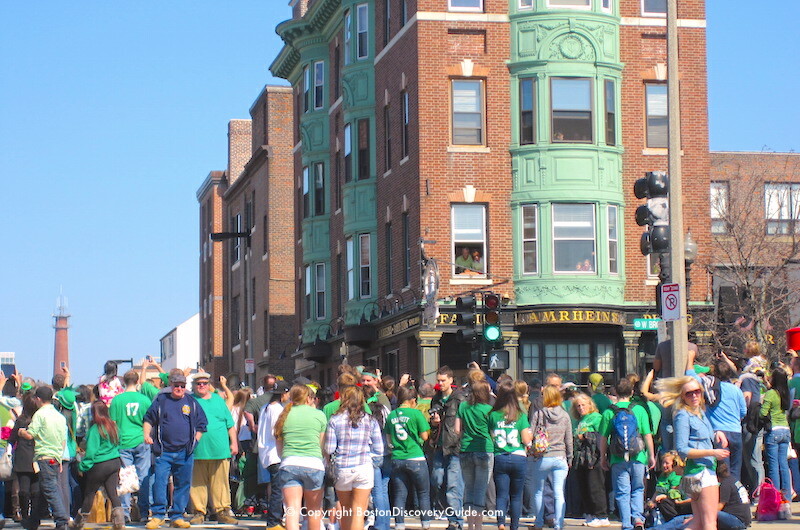 At least a hundred groups and many thousands of marchers participate as the parade winds its way around South Boston, where Irish immigrants first settled in the early 1800s and still home to a large Irish-American community. 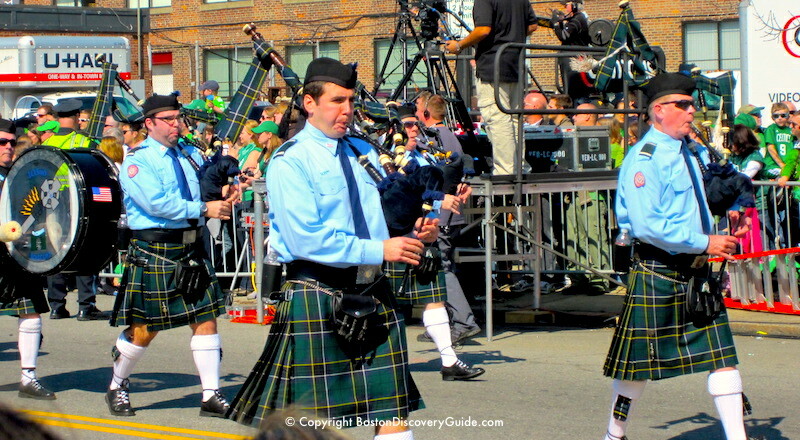 Up to 1 million people line up to watch the colorful floats, Irish and American pipe and drum bands, and marchers representing a wide range of Irish-American groups. You may spot most Boston-Irish politicians among the crowds, if not actually marching. The parade has been a big Boston event every year since 1901 - except for 1993, when it had to be canceled after a blizzard closed down the city. The South Boston Allied War Veterans Council organizes the parade. 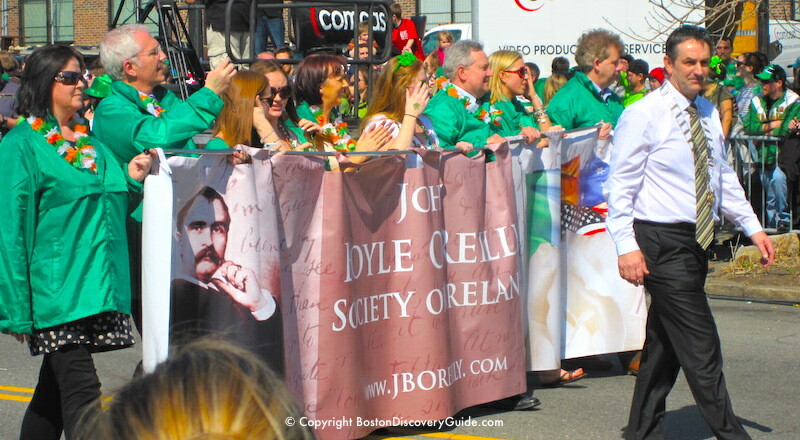 Although the parade includes a diverse group of marchers, one of the most unusual is the John Boyle O'Reilly Society of Ireland, devoted to keeping alive the memories of this 19th century Irish patriot, poet, and Boston journalist. As a young apprentice printer in Ireland, O'Reilley distributed political pamphlets protesting British rule in Ireland, escaped imprisonment in Australia by gaining passage on a Yankee whaling ship, and ended up running the Boston Pilot, now known as the Boston Globe. At the Globe, O'Reilly repeatedly denounced discrimination and promoted the civil rights of the Irish, Jews, Native Americans, and Blacks. 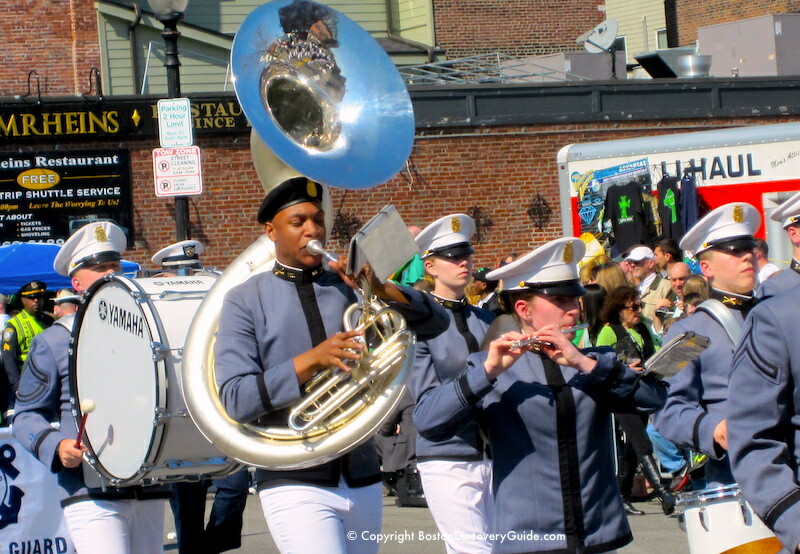 A wide variety of traditional Celtic music, marching brass bands, and Colonial-stye fife and drum units provide lively music throughout the parade. You'll hear the haunting music of bagpipes throughout the afternoon, as the parade typically includes several bagpipe bands such as this one. Colonial fife and drum bands celebrate Boston's revolutionary spirit. And lots of brass bands keep up a lively pace all afternoon. 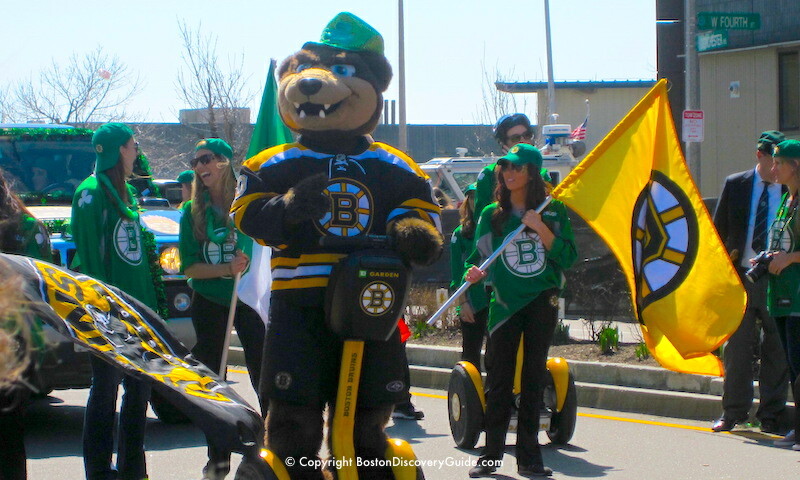 Come experience the St Patrick's Day Parade for yourself - along with the Boston Marathon in April, it's one of the traditions that define our city! What to Do After the St Patrick's Day Parade? Wondering what to do before or after the parade? 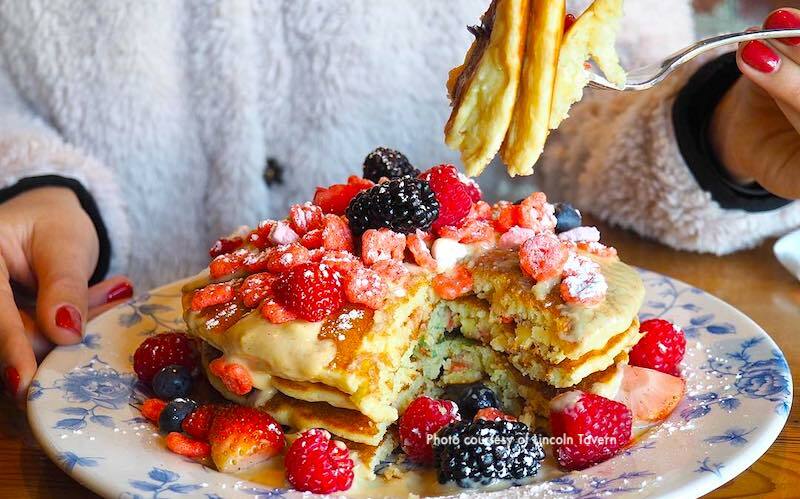 Publico Street Bistro & Garden (11 Dorchester Ave) - Start with Latin-style avocado toast, don't miss the lobster benedict, and share an Argentinian meat platter or seafood paella - so much to love here! Worden Hall (22 W Broadway) - With over 100 whiskeys, you may never get to the food - but if you do, go for bourbon hoisin steamed pork buns and a soppressata and garlic sausage deep dish pie - oh, and a Guinness crème brulée. 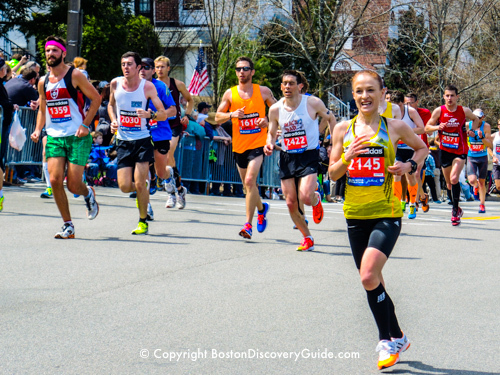 More Boston March Events - Lots to do this month in Boston!